Laser skin resurfacing is useful in reducing wrinkles on face and skin problems like acne scars. 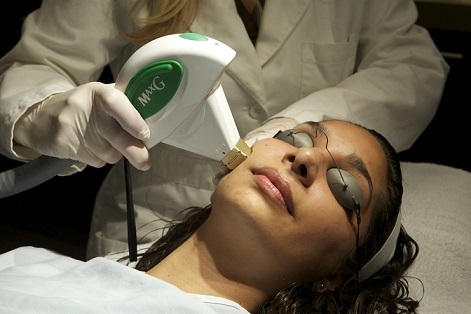 In this method laser beams are directed towards the problem area to remove layers of skin so that new skin can develop. Who is right candidate for this procedure? If your skin is very dark, are trying this procedure for stretch marks or you still having active acne then laser skin resurfacing might not be suitable for you and you need to talk with your doctor first. There are 2 laser types which are used in this procedure, one is carbon dioxide (CO2) and the other is erbium. Let us look at both of them in the next section. This technique is commonly used for various skin problems ranging from warts, wrinkles, enlarged oil glands on areas such as nose to scars. In CO2 laser skin resurfacing ultrapulse is used which refers to short pulsed light beams which are directed on the skin in scanning pattern for removal of very thin skin layers and cause insignificant heat damage to the skin. Normal recovery time is about 2 weeks. This other technique removes somewhat deep face wrinkles and wrinkles on areas such as hand, chest and neck. The advantage of this method is that there is very less burn in surrounding tissues and recovery time is faster compared to CO2 technique. For people with dark skin complexion this technique would yield better results that the other method. Begin with consulting a dermatologist to know if this treatment is right for you. Doctor will go through your medical history and present health to determine which laser treatment will be more suitable for you. Remember, in case you get cold sores around mouth than laser resurfacing can cause breakout, so it is important to tell your doctor about the problem. Usually, your doctor will advise to stop taking medications such as aspirin or vitamin E at least ten days before your treatment date. Antibiotics are given to stop any bacterial infections and antiviral medicines for people who suffer from cold sores. What happens during & after treatment? Normally, for these procedures you do not require overnight stay and can go home after the treatment. In case area to be treated is small, doctors generally use local anesthetic to numb the part. If whole face is being treated then general anesthesia can also be given. For full face the average treatment time is around 2 hours while if it is only some part of the face then the procedure can be completed in 30-45 minutes. After the procedure completes you will be able to return back and will have to clean the treated area 4-5 times every day and apply ointment prescribed by doctor to prevent scab formation. Healing process will take between 10-21 days and depends upon the skin condition that was treated. After the skin completely heals it is advised to use makeup especially the oil free ones to reduce redness which can stay up to a month. It is also important to use a sunscreen after the treatment as the skin is much lighter and it should be SPF 50 or higher. Additionally, keep skin moisturized and start using glycolic acid products 6 weeks after the procedure. What are the possible complications to be aware of? You may get slight swelling after laser skin resurfacing and using ice pack over the area that was treated helps to reduce the swelling. An itching sensation is also normal after the treatment and it normally subsides in a few days.